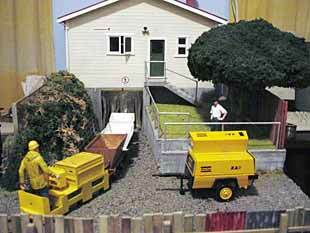 The G-Whizz Traction Company is a G-scale micro layout in 2×3 feet (60×90 cm). It is made possible by the tireless work of the Traction Yahoo Group, who discovered by experiment that virtually all G-scale equipment will run around a 10-inch radius curve (25.4 cm)! Included are Bachmann four-wheel cars/trams, as well as four-axle cars. The G-Whizz line is a small town trolley line that features an interurban link with the outside world. Primary operation involves a four-wheel city car negotiating the inner oval in a counterclockwise direction. An 8-wheeled wooden interurban car, perhaps bashed from a Bachmann passenger carriage, occasionally arrives from an offstage cassette via the running line at the front right corner. The interurban swings clockwise through town and pauses at the traction terminal on the outer line. Passengers switch from city car to intercity mode by walking through the terminal shelter. The interurban then reverses its poles (we’re assuming that overhead power will be used here) and departs in a counterclockwise direction, returning to its offstage cassette. The city car resumes its endless circling until the next interurban arrives or until it’s ready to retire for the night in the car barn. Repairs are also conducted in the barn. This llittle layout provides a lot of operation in a very small space — who says they don’t have room for large scale trains? And it provides some challenges to the builder as well: the special work in front of the carbarn should keep your trackbuilding skills on the boil! In O scale, the line would use 8″ radius curves (20 cm) and would occupy about 20″x28″ (51×71 cm). In HO or OO, with 6″ curves, the dimensions could be roughly 14″x22″ (36×56 cm). In response to several requests, we have concocted an HO micro traction layout, the Hidden Valley Traction Co. Actually, it’s two micro traction layouts, each 12″x24″, which join to form a larger layout, 12″x48″ (still micro sized). The Hidden Valley line runs a variety of hand-me-down trolleys to offer passenger service throughout the valley. If you make the loops (balloons) one-way affairs, it’s relatively easy to run as many as four cars simultaneously on the layout — just watch the single-track bottleneck carefully. On weekends the traffic can be pretty heavy out to Electric Park and home again in the evening. To add operating interest, there’s also provision for freight handling — using a freight motor or, with some careful coupler adjustment, hauling traction freight cars. In either case, the cars enter from beyond the freight house, and the goods are distributed along the line, primarily to the big Co-op warehouse. Radius is 5″ throughout. Track will have to be a roll-your-own deal, and the turnouts will need to be hand-laid too. The only complex one is the lap switch (or three-way turnout) in front of the car barn. The choice of using working overhead is yours, but shame on you if you don’t! All in all, for a very tiny layout even by traction standards, the Hidden Valley offers a lot of operating fun. Harry Symonds, a member of the Left Coast Modular Railroad Club, decided to make a micro layout that could stand alone but could also be inserted into a standard module for club running. 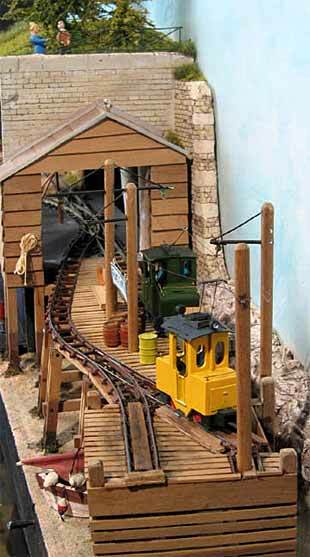 The result: TuQuay and Canal Street RR, an 18″x24″ (45×60 cm) layout that fits comfortably into the corner of his club module. The story of the micro layout , according to Harry: “The good people of ‘TuQuay’ decided that they did not want steam or diesel power in town and created this little traction company instead. 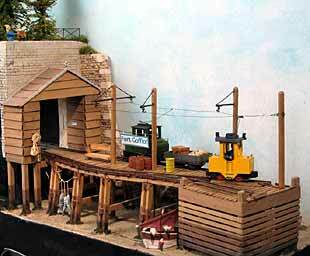 A tiny 0-4-0 electro-critter provides the power, moving people and goods from the quays to the various warehouses and to the main module interchange track.” Harry designed the layout for HOn30 or OO9 trams. Because he lives in a manufactured home, he had to limit the size of the layout to an 18″x24″ shelf. And so a canal town micro layout was born! Passengers circulate in traction company cars through town and out to the mainline interchange station. Freight is picked up at both quays and at the interchange track, to be distributed to various sidings around town. The little “critter” locomotive spends iits nights in the carbarn. 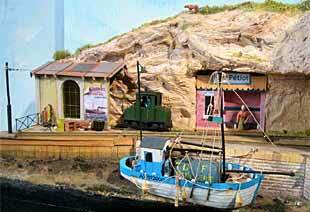 The scenic attractions of this tiny traction layout are obvious! And on club meeting nights, Harry takes his larger module out of storage, inserts the micro layout into position, and goes off to a very satisfying operating session — and no doubt, to a lot of complimentary comments! Once again, Giles Barnabe comes up with a slightly different slant on an existing track plan, in this case on Chris Ellis’s Small Street/Kleinhof design. This German Tramway/Railway Interchange measures 4ft by 1ft and takes advantage of the space-saving geometry of Fleischmann HO Profi track–a useful strategy for any HO micro layout. Giles describes the layout this way: “What we have is a tram terminal, situated just outside an old city somewhere in Germany. An industrial suburb has grown up outside one of the town gates, and the urban trams emerge from the archway to reach a stub-ended terminus that includes a parcel depot/tramway information office. “Just before the end of the tramway there is a connection with a railway freight branch. This could be a private industrial affair, part of a Ringbahn setup, or just straight DB. At all events there is just room for a small fiddle yard hidden by a row of shops, big enough to hide a four-coupled locomotive and one or perhaps two short wagons. “One of the sidings serves a coal merchant and is for railway use only, while the siding nearest the city gate is a joint railway/tramway line. The warehouse here could belong to a freight forwarder–Schenker or the like–and so would be quite busy with rail wagons and possibly a parcels tram from the city’s network. 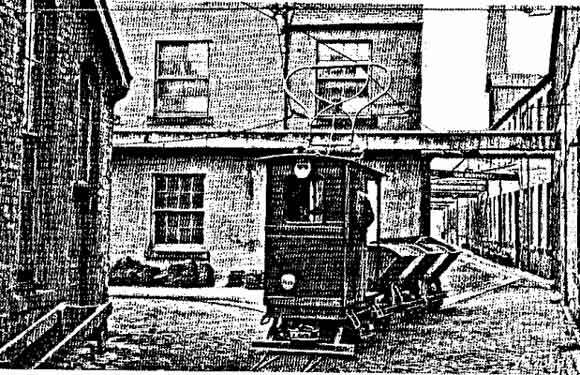 “The railway shunter occasionally appears to shunt the two sidings and could also exchange the odd wagon with a freight-motor tram (steeple cab design on a Spud motor). Perhaps the local brewery is within the city walls, providing an excuse for some colourful beer vans, or the tramway’s power plant may need the occasional wagon of coal to be hauled into the city. “The tramway’s overhead wire extends through the gateway to the terminus, and also covers the ‘joint’ siding. However, it goes only part of the way along the track linking with the railway — just far enough to be able to couple up to a wagon left here by the train (there should be clearance for this actiivty between the turnout and the double-slip). Ed. Note: This layout could easily be set in the U.S., Britain, Australia, or almost anywhere in the world where trams/trolleys run or used to run. Just change the scenery, the operating plan works fine! Industrial Electric Narrow Gauge — the Works! What more can a traction fan who wants a narrow-gauge micro layout ask? The above artist’s rendering is based on a blurry photograph in the 1900 catalog of Arthur Koppel, a German firm who furnished equipment for light electric railways to serve industrial narrow-gauge applications. The original photo was taken at a dye works in Glasgow, Scotland, sometime just before the turn of the Twentieth Century. It’s a nostalgic view, with some delightful little trains. Steve Bennett, from Exeter in England, passed along this gem and is very fond of this particular view — it encapsulates an important part of the appeal of small, industrial railways. 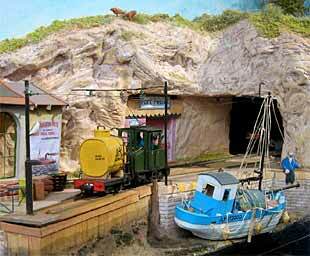 So I have designed a micro layout to capture this scene as well as provide a working electric railway in a dye works! It’s dedicated to Steve Bennett. Footer’s Dye Works is a two-foot-square (60-cm-square) layout designed to be viewed on all four sides. The red arrow at the bottom right shows the position which provides the view in the Koppel photo rendering. Designed with six-inch (15 cm) radius curves, the layout is intended for 16.5mm gauge and could be made in Gn15 or On30/O16.5 scales. The same layout could be built in the same space using 9mm gauge track and On18/O9 or HOn30/OO9/HOe scales. The intention is to use overhead wire for current collection with bow collectors on the locomotives. During the early 1900’s, bow collectors were common in Europe, and not unknown in Britain, North America, and most of the world. So the locale of the layout could be almost anywhere. The rolling stock will be small four-wheeled cars/wagons and funky little “juice wagons” of industrial electric locomotives. 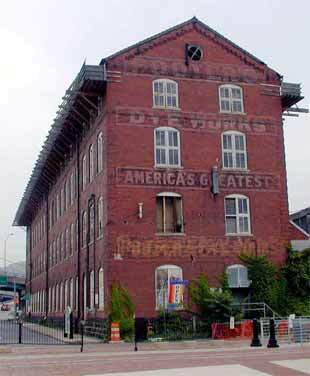 One possible North American setting is the prototype Footer’s Dye Works, in Cumberland, Maryland, USA. (photo at left). This charming old building is being restored as an industrial museum located right next to Cumberland’s historic railway station. In its heyday, Footer’s could well have been served by a small industrial railroad like this one (though it probably wasn’t)! In the layout plan, cars enter tthrough the front gate (upper right) from a cassette that is plugged in long enough for them to roll into the works yard, then removed and the gates closed (animation, anyone?) The principle commodity is coal for the power plant, and those cars are delivered directly into the power house siding, with empties picked up and delivered to the gate. The roof of the factory building at the top is removable, to allow rearrangement and replacement of rolling stock — but you would probably not need to use it very often in this little railroad. The operating pattern will be as varied and as interesting as the stock you build to run on it! François Fontana and Denis Fournier Le Ray started out to make Les Tramways de Port Petiot à Fort Goffiot as a joke. And it has retained a light-hearted charm in its approach to depicting traction railroading on an uncharted “South European island”! Both friends live in France, but several hours’ journey apart — François in Saint Ettienne, Denis in Nantes. They each began with a space half the size of an A4 sheet of letter paper (sliced lengthwise). In their allotted 10.5×29.7 cm space (that’s 4 x 11.7 in), each built a tramway terminus — François the shipping wharf at Port Petiot, Denis the fort gate and wharf at Fort Goffiot. Each half features a sector plate and a single spur. Between the two towns, situated on opposite sides of the island, stands a giant mountain of gypsum, ready to be mined (made by François). The two layout halves were brought together for the first time at the French national narrow-gauge train show, Expométrique, in Paris. They were joined by a 26 cm tunnel containing two turnouts to complete the track plan. With bated breath, the two railway magnates turned on the current to the overhead wire and track … and the little trains ran beautifully! They still do. All rolling stock is scratchbuilt of plasticard (styrene) and brass. The little people, birds and fishes are made from Plasticine.Tracks are sectionalized, so you can operate several locomotives on the layout (you can see the section toggles on the control panel beside the tunnel). Overhead wire is 0.2 mm in diameter. François now has custody of the layout, and he has built a wooden case for it along with added details and the mountain that separates the two towns. And the tiny tramway continues to perform the essential task of hauling freight and passengers from one side of the island to the other — by passing straight through the mountain in a tunnel to the other side! When you look at these photos, remember that both halves of the layout, side by side, would take up the space of one sheet of letter paper! Excellent modeling, and a track plan that actually portrays a working tramway.